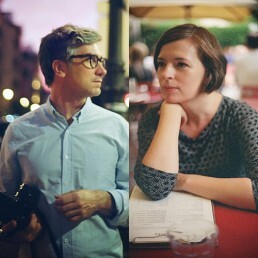 Peter Simonite and Annie Gunn are a directing/shooting team from Austin, TX. Together they share a passion for iconic imagery emotional storytelling and exquisite production design. Their first collaboration „Postcard From 1952″ was celebrated internationally as one of 2012’s most highly regarded music videos. Annie brings a sensitive eye and cultivated taste for imagery and emotion. Her still photography has been shown at one-woman shows and on Voxtrot album covers. Peter developed his filmmaking skills working as a professional cameraman on feature films – most notably as a 2nd unit cameraman for Terrence Malick. He currently works internationally as Director of Photography shooting feature films and commercials for clients like Nike, Intel and Rolex. He has directed several music videos including “Everything Hits At Once” for Spoon which Rolling Stone named as one of the greatest animated music videos of all time.